Set to the backdrop of the 2004 Boxing Day tsunami, Running Wild is a true visual masterpiece, opening with a picture frame set of detritus from disaster, all broken tables, sun loungers and destroyed pieces of everyday life, this is a piece that captivates the eye throughout thanks to Paul Wills' set design. The lighting from James Whiteside also creates a wonderful mix of colours to bring this forest world to life. 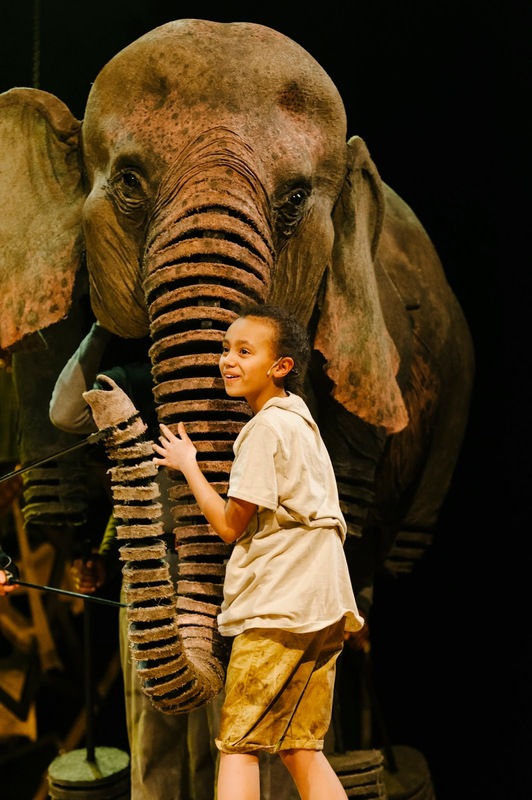 Inhabiting that world are the stars of the show, a collection of brilliantly realised animals; from Oona our star to orangutans and tiger, the puppetry work from Finn Caldwell and Toby Olie and their team of performers is exemplary. 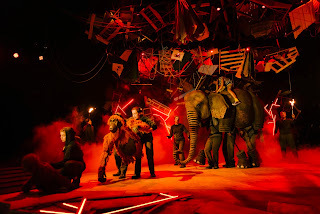 They are the true characters of the show and at that devastating closing moment of the first half you can't help but feels pangs of emotion for these magnificent beasts that feel truly alive. The humans take the backseat in this production to the wonder of the puppets and are often lacking depth, more relying on caricature. Lily (played on the evening by India Brown) is for the first half a brattish, irritating child, true she is going through a tough life, but she is demanding and cruel to her true friend Oona. She softens a little in the second half as realisation dawns however and you learn to love her more. It is, however, a tremendously confident and brilliant performance from the young star. From the grown-ups, Liz Crowther as Grandma comes out of the play with the deepest character, with her emotional portrayal through the pursuit of her family. There is a strong and evil portrayal of Mr Anthony from Jack Sandle, although at times this character is so obviously dastardly that you feel he has fallen from a cartoon. He is though at times believable in his threat of menace again child and animal alike. 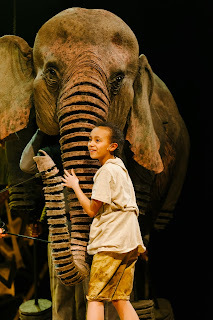 On opening night at Royal & Derngate there were technical issues which saw a half hour delay to the show, and although these were unspecified, there felt a definite issue with the sound balance during the show, with some of the dialogue lost in the mix of sound. Directors Timothy Sheader and Dale Rooks keep the spectacle flowing with visual momentum even if on occasion the story stumbles a little in pace during the first half, however with the added danger after the interval, it gathers a great pace up to its emotional, but a perhaps inevitable conclusion. Running Wild is an excellent piece of theatre offering a depth of story to keep adults and children entertained throughout. It can at times be a disturbing tale and may be a little scary for some younger children, however, it has its morals clear for all and it does have a very relevant story to tell, one that truly needs a hearing. Performance reviewed: Tuesday 23rd May, 2017 at the Royal & Derngate (Derngate), Northampton.